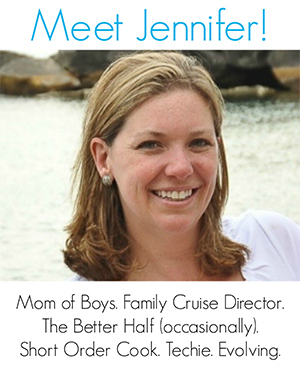 Whether you’re Jewish or not, understanding the Jewish faith and its beautiful traditions is important for any child. When my kids were little, we would read books like these Hanukkah books for preschoolers to make sure they understood the religions of the world and the people around us. 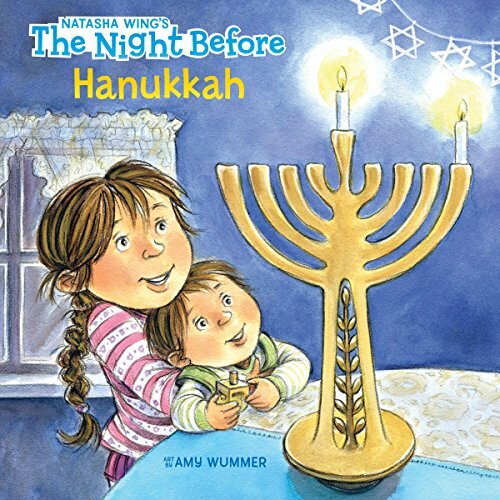 You can find these Hanukkah books for preschoolers at your local library or purchase through the affiliate links provided for your convenience. 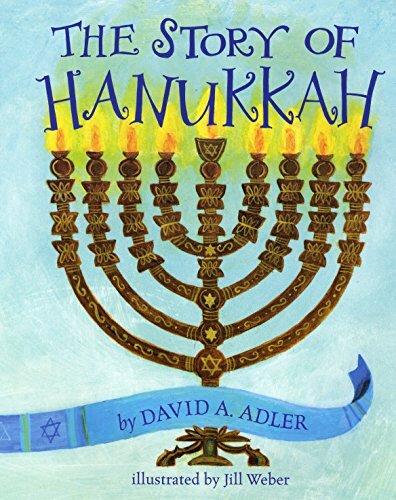 The Story of Hanukkah: Hanukkah is a wonderful time filled with games, food, family, and fun. It’s also the celebration of an ancient miracle, and retelling and remembering the story of that miracle is an essential part of the holiday, for young and old. The story of the courageous Maccabees is retold in simple yet dramatic text, accompanied by vibrant paintings of the battle, the Temple of Jerusalem, and the oil which miraculously burned for eight long nights. Plus, a traditional recipe for latkes is included, as are directions for the dreidel game, for readers who want to continue the festivities at home. 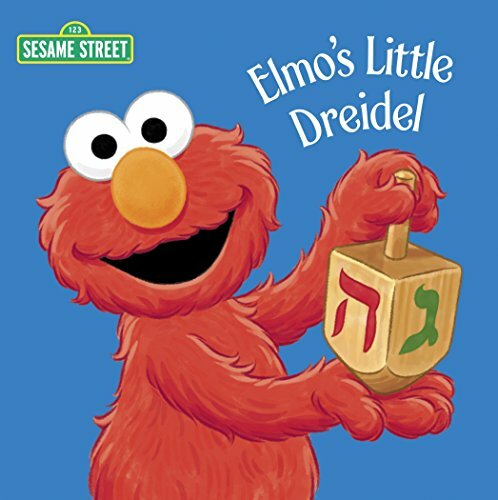 Elmo’s Little Dreidel (Sesame Street): This sturdy board book introduces toddlers to the traditions of the Jewish Festival of Lights and even teaches them how to play dreidel themselves! What’s a dreidel? Elmo wants to know! He finds out as he celebrates the first night of Hanukkah with a friend’s family. He watches Gil, Susie, and their parents light the menorah and joins in as they sing Hanukkah songs. After supper he learns to play dreidel, the traditional Hanukkah spin-the-top game. And, at the end of the evening, Elmo gets his first Hanukkah gift—his very own little dreidel! 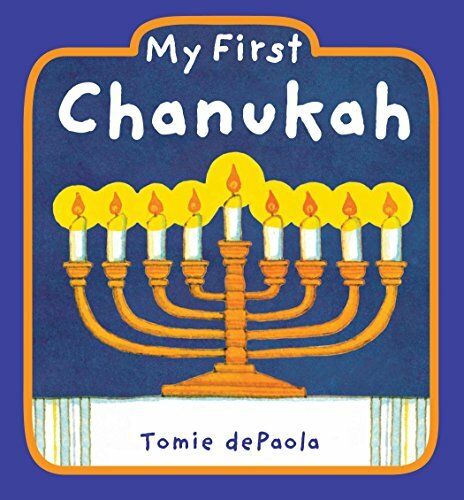 My First Chanukah: In My First Chanukah, Tomie dePaola’s gentle text and understated artwork provide insight and background into the holiday for young readers. Eye-catching foil lights up the cover! 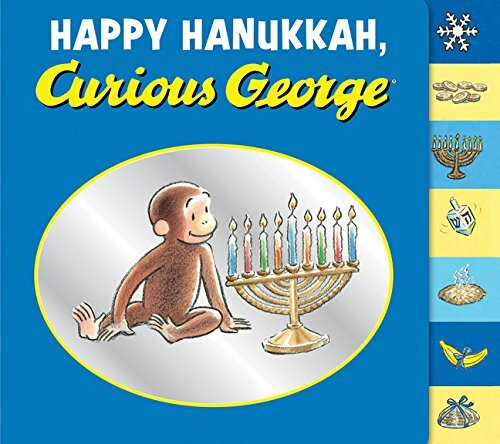 Happy Hanukkah, Curious George: It is the eighth night of Hanukkah, and George and his friends have gathered for a celebration. They light the menorah, spin the dreidel, make latkes, and learn the importance of mitzvah! In this tabbed board book, youngsters will even find a tasty latke recipe and instructions for constructing a dreidel, with rules for play. A festive foil-stamped cover makes this a fine holiday gift for fans of Curious George. How Do Dinosaurs Say Happy Chanukah? Filled with warmth and cheer, this new book by the bestselling team of Jane Yolen and Mark Teague makes a perfect gift to be read again and again, year after year. Come along on a joyful romp filled with tumbling dreidels and melting gelt as America’s favorite prehistoric pals spread a little mischief this season. Children will laugh out loud as dinosaurs fidget, fuss, and stomp through every occasion, while their human parents shift from shock to weary patience. 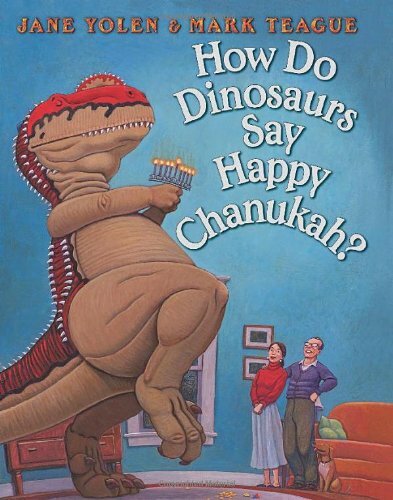 How do dinosaurs say Happy Chanukah? The same way they say Merry Christmas: With an abundance of love, joy, memory, and gratitude. Grover’s Eight Nights of Light (Sesame Street): The story includes gentle messages about friendship, kindness, and tolerance to highlight the Sesame Street mission of helping kids grow smarter, stronger, and kinder. 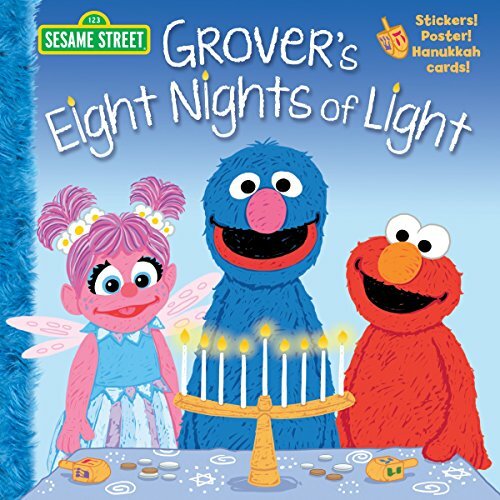 It’s Hanukkah on Sesame Street, and Grover invites his friends to a Hanukkah party at his house. 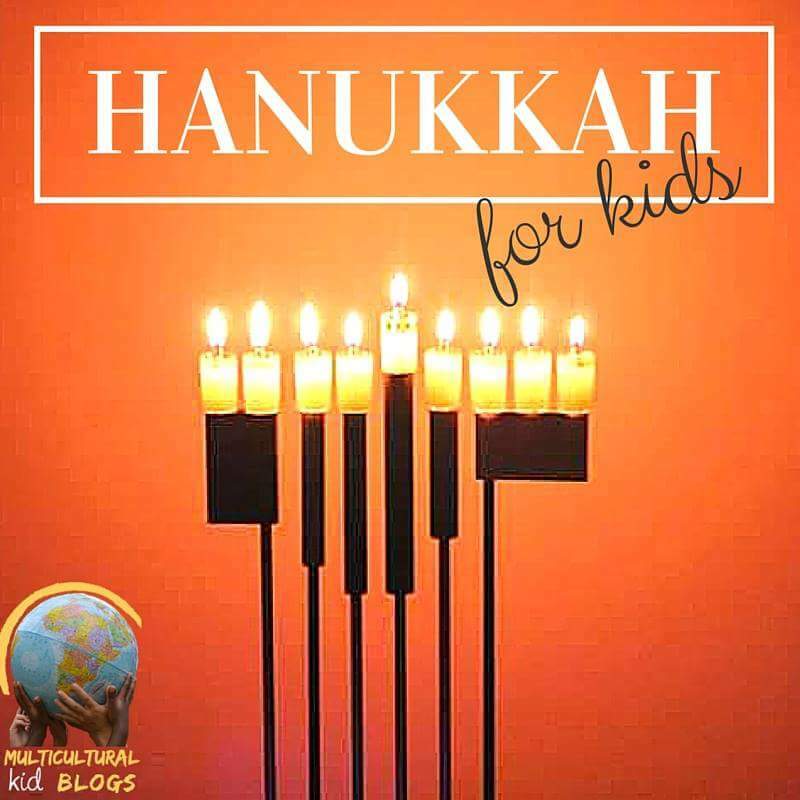 Girls and boys ages 2 to 5 will learn the why and how of celebrating Hanukkah along with Elmo, Telly, Abby Cadabby, Cookie Monster, Big Bird, Oscar the Grouch, Bert, Ernie, Zoe, and Murray. The story offers a simple outline of the holiday’s origins, lighting the menorah, playing dreidel, and eating latkes and other traditional delicacies. This colorful paperback storybook offers stickers, press-out Hanukkah cards, and a poster with a Hanukkah party game. 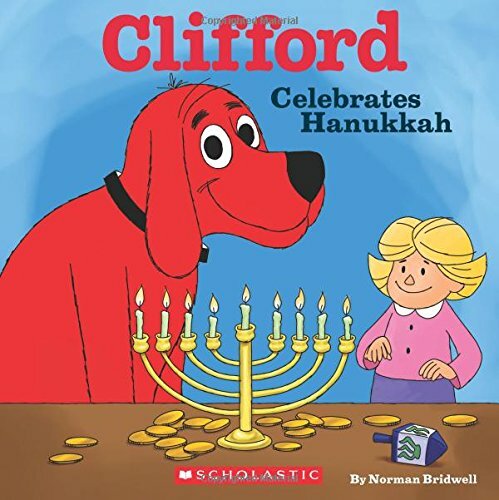 Clifford Celebrates Hanukkah: Celebrate Hanukkah with Clifford and Emily Elizabeth! Clifford and Emily Elizabeth are celebrating their first Hanukkah. They love hearing the story of Hanukkah, eating “latkes” (fried potato pancakes) and “sufganiyot” (fried jelly donuts), and playing dreidel. After dinner, Clifford and Emily Elizabeth take a trip into town to see the giant menorah. But when they get there, they discover that one light is broken. It’s too late in the evening to call a handyman, but maybe Clifford is big enough to help save Hanukkah! 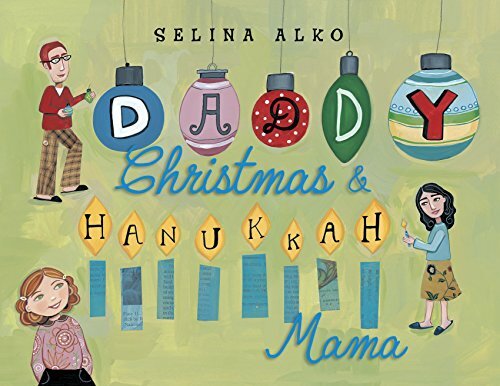 Daddy Christmas and Hanukkah Mama: Selina Alko’s joyous celebration of blended families will make the perfect holiday gift for the many Americans who celebrate both Christmas and Hanukkah. Holiday time at Sadie’s house means golden gelt sparkling under the Christmas tree, candy canes hanging on eight menorah branches, voices uniting to sing carols about Macabees and the manger, and latkes on the mantel awaiting Santa’s arrival. 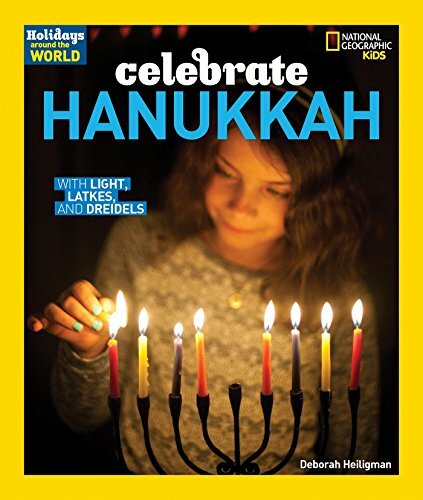 Holidays Around the World: Celebrate Hanukkah: With Light, Latkes, and Dreidels: With dazzling images and engaging text, readers learn about the historical and cultural significance of Hanukkah and why it is celebrated around the world. From the lighting of the menorah to the special foods that are shared to the spinning of the dreidels, they’ll get insights about this holiday’s traditions and the Jewish faith. This book also offers fascinating facts, a recipe, and a Common Core-aligned activities. The Night Before Hanukkah: It’s the night before the eight-day celebration of Hanukkah begins, and everyone is excited! Each evening, the family gathers to light the candles and share holiday traditions such as playing dreidel, eating latkes, and exchanging gifts. The seventeenth title in Natasha Wing’s bestselling series, The Night Before Hanukkah captures all the joy and love in one of the most wonderful times of the year! 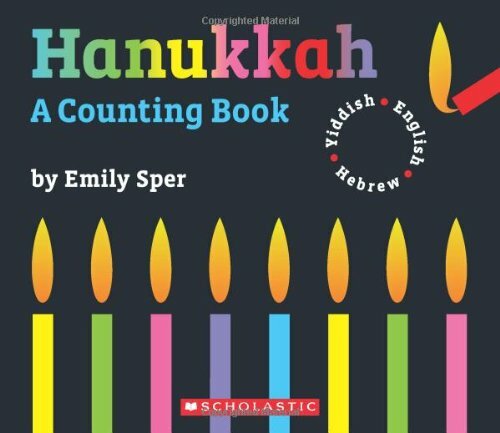 Hanukkah: A Counting Book: Your child will learn about Hanukkah, as well as how to count all 8 nights in Hebrew and Yiddish! Pronunciation guides help kids say the words, and die-cuts reveal the candles as they are lit each night. Simple graphics and design elements enrich this holiday offering. 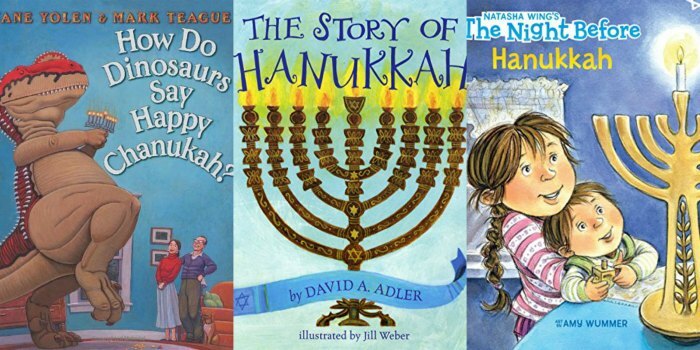 Like these Hanukkah Books for Preschoolers? Find even more engaging book lists for kids with more than 100 book-themed reading lists!